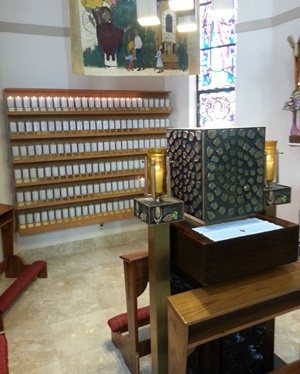 Our Votive Candle Wall is located on the north side of the Church behind the Tabernacle near the Altar. The Votive Candles are electric and are lit on the first business day of each month. Donation is $25 per month per candle or $240 for 1 year per candle. These candles stay lit 24 hours a day / 7 days a week. 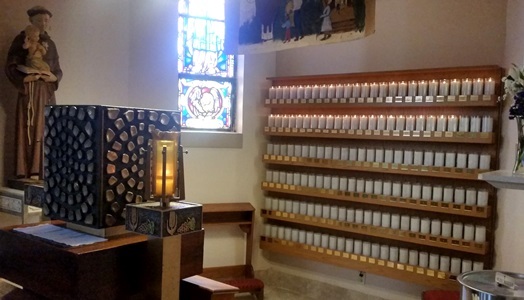 In the lighting of candles we remember and truly live the words of Our Lord: “I am the Light of the World.” In the lighting of candles we not only pray, but our prayers become smaller symbols of the One Light of Christ. In burning candles, our prayers rise up to Heaven day and night; prayers for the saint’s intercession are also common because of their friendship with God in Heaven. Saints are powerful intercessors. The lighting of candles has been observed since the early the time of the earlymartyrs. Candles can be lit in memory of a family member or friend who has passed away; or for celebrating a birthday or anniversary. Click on our Votive Candle Wall Request to print our form. A check is payable to St. Martha Church and must accompany the request form. Please print clearly to minimize errors. Forms can be mailed or brought to our Church Office.